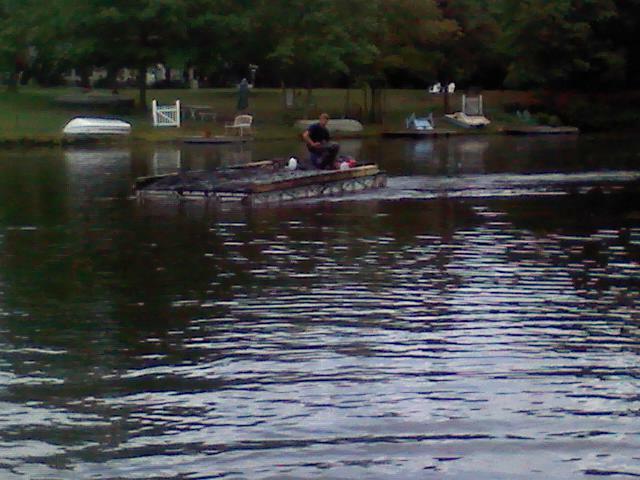 In the winter of 2010 we received a call from a gentlemen in New Jersey running a pond cleanup operation. He had an amphibious “scum scooper” but needed a floating platform to hold the tailings. 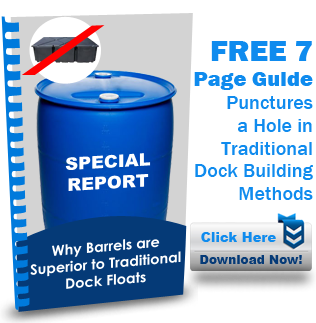 The problem was that our standard barges and floating docks use 55 gallon poly drums for floatation and sit about 20″ above the water when empty. This was 2″ higher than his scum scooper could reach. He called back a month later with an idea: “What if we redesigned the barge to work with 30 gallon barrels, how much lower would it sit on the water?”. Well, a 30 gallon barrel is only 19″ in diameter (a 55 gallon is 23″). We came up with a nice design that gives him 2000lbs+ of capacity while sitting less than 16″ above the water when empty. This is an 18×8 licensable barge kit including all the fasteners. The customer supplied the deck and the barrels.